Founded in Pella, Iowa, Vermeer serves customers in more than 60 countries with a full line of tree care, landscaping, rental, environmental, underground construction, surface mining and agricultural equipment. 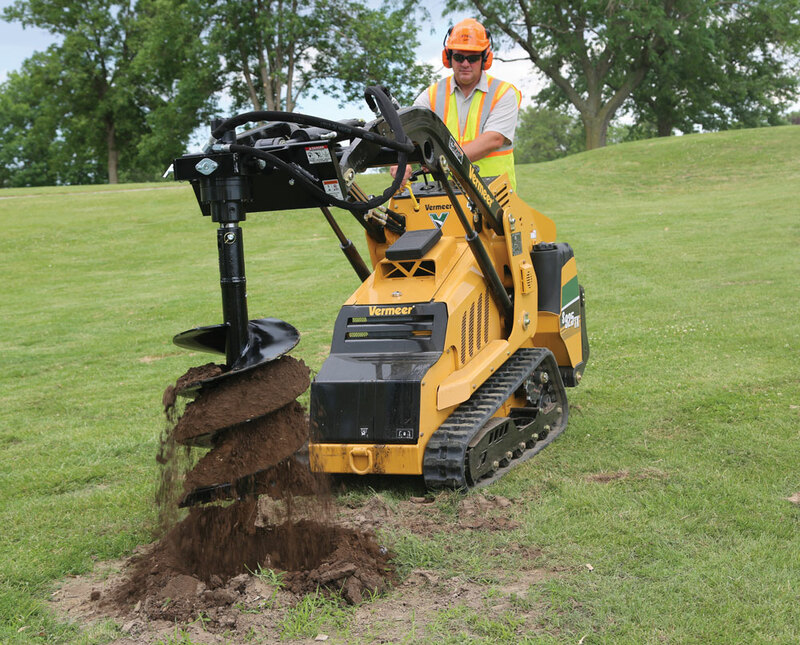 Vermeer introduced its first compact tool carrier in 2003 to help contractors in the landscape, rental, tree care and utility markets complete jobs more efficiently. Vermeer currently offers six compact tool carriers ranging from 24.8 to 40 hp. The newest addition to the Vermeer compact tool carrier portfolio is the S925TX. With a rated operating capacity of 925 lbs and maximum hinge pin height reach of 84.5 in., the radial-lift path of the Vermeer S925TX makes easy work of lifting and dumping heavy loads. The mini skid steer features a dual auxiliary system which allows the operator to switch between high flow for ground-engaging attachments and low flow for maximum control. It is also equipped with a universal mounting plate that fits a broad range of Vermeer-approved attachments. The Vermeer S925TX mini skid steer is offered in three smooth-running, high-torque, four-cylinder engine options, including a 24.8-hp Kubota V1505 diesel engine, a 40-hp Kubota WG1605 gas engine and the 35.1-hp Kubota V1505 diesel engine offered only for international markets. Contractors can further customize their mini skid steer loader with either 7-in.-wide tracks that produce 5 psi of ground pressure or 9-in.-wide tracks with 4 psi of ground pressure for even better flotation. Vermeer also recently introduced the CTX100 mini skid steer. It is the largest model in the Vermeer compact utility loader lineup. The CTX100 features vertical-lift boom arms — which keep the load closer to the machine — offering a higher lift capacity than a similarly sized radial-lift machine. Vermeer also increased the hinge pin height to 89.5 in. to make loading materials into a brush chipper, truck or trailer more efficient. The CTX100 has a tipping capacity of 2,958 lbs and a rated operating capacity of 1,035 lbs. It has a 40-hp Kohler KDI Tier 4 Final diesel engine and a universal mounting plate to power a variety of attachments. The CTX50 features vertical-lift arms and has a 600-lb rated operating capacity, a tipping capacity of 1,715 lbs and a full lift height of 72 in. The CTX50 has a 25-hp Kohler Command PRO electronic fuel-injected gasoline engine and utilizes a four-pump hydraulic system. A unique stand-on platform design also helps keep the operator out of the mud and debris and provides optimal viewing of attachments during operation. The S450TX offers the customer the ability to customize the machine with the choice of track options. A narrow 7-in. track provides a smaller machine footprint for tight work areas, such as landscaping applications and residential construction. The standard 9-in.-wide track offers reduced ground pressure for increased flotation and stability. Read more about Vermeer by clicking this link.